The first time I heard about the story of the Yang clan was when I flew all the way to Bandar Seri Begawan to interview Wu Chun in May. He has just been cast in the movie and he was very excited about it so when I returned and started writing the story, I had to look up what this epic was about. Aside from Ekin and Chun, the other well-known cast members are Vic Chou (Zai Zai) and Raymond Lam (he of the 2011 HK photo scandal with Mavis Pan). Vic plays the third son while Raymond is the fifth. The others are actors from the mainland. Perhaps the most prominent production on the Yang clan was in 1985 for the anniversary of TVB, The Yang Warriors Saga, with Hong Kong’s top actors Andy Lau, Francis Ng and Tony Leung. The story of the Yang clan has also been retold in Chinese opera, and other TV and drama adaptations, including the story of the women in the family. Raymond Wong, who is producing the film, did not discount producing one on the female warriors but that would depend on how Saving General Yang will fare at the boxoffice. 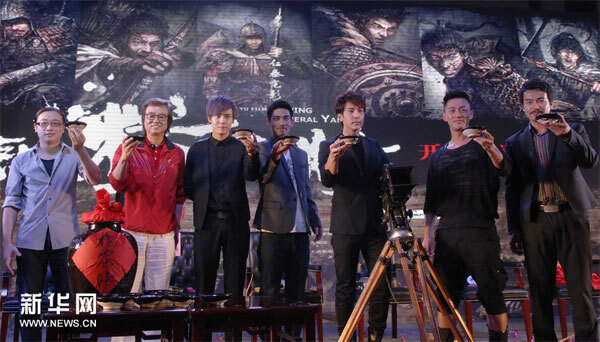 The new cast with Ekin Cheng (3rd from left). The new movie costs $15 million and looks promising with Ronny Yu, who directed Jet Li’s Fearless, at the helm. It comes out next year. oh so it was you who ginx the 14 Amazon’s. You named Cecilia Cheung…and she was in it and totally ruined a bad movie for me. Maggie Cheung as Matriarch? she doesn’t look old enough. From the above, age wise, isn’t Wu Chung older than Vic Zhou and Raymond Lam?